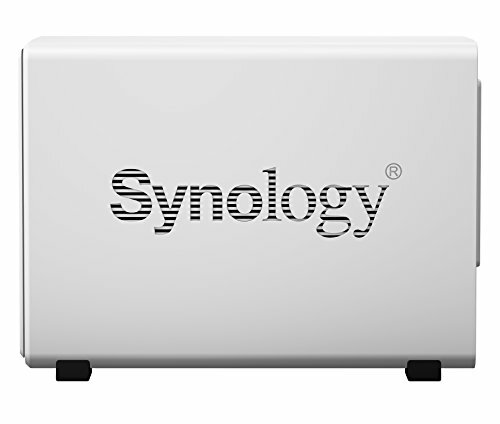 It won’t take you long to figure out that Synology’s new DS218j lies at the budget end of its NAS range. The white plastic box literally slides apart giving you access to internals that allow for two SATA hard disks (3.5-inch or 2.5-inch) while the (optional) screws which seal it shut are in a separate bag. So you’re essentially paying for a cheap, hollow plastic box with some circuitry inside. We approve. 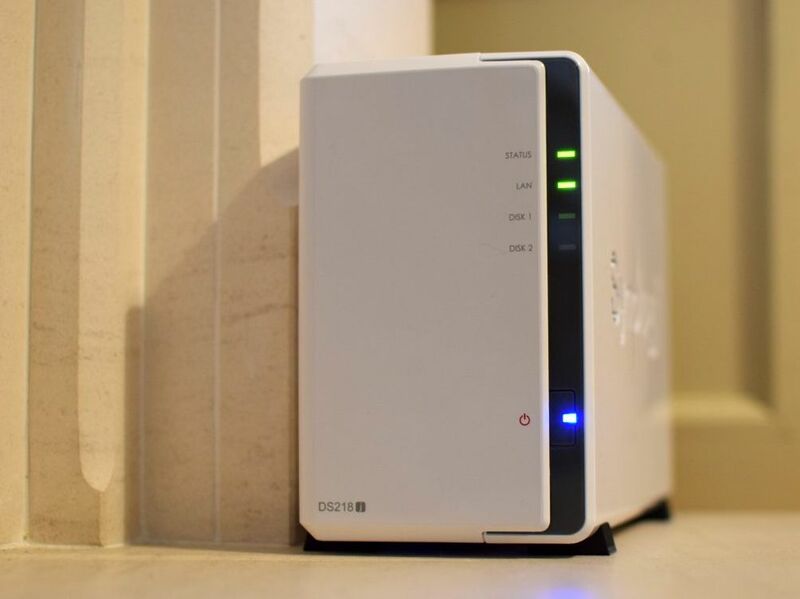 Over the years we’ve been served all manner of two-bay NAS devices including many, overheating, sealed units which became door-stops as soon as any part of them failed. Here, we pulled the box apart, slid in two hard drives, closed it up and turned it on. Too easy. 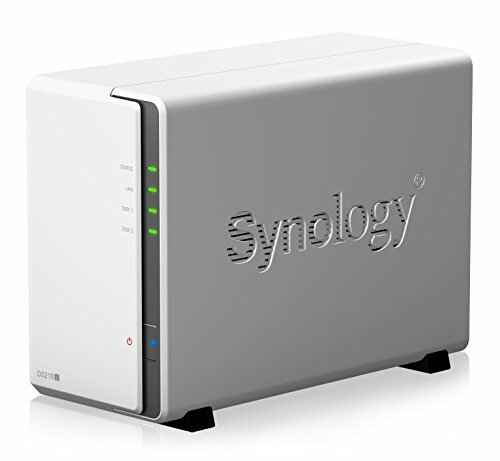 Synology makes (very) many NAS devices. The DS218j is one of the two-bay value models with the ‘j’ designation referring to its cloud capabilities (natch). Inside is a 1.3GHz dual-core processor with 512MB RAM. Outside there are two USB 3.0 ports plus Gigabit Ethernet. The lack of powerful innards keep power consumption down with it consuming almost 18W when under heavy operation which is impressive for a device that’s always on. A Wake On LAN function means you can keep it practically hibernating much of the time too. 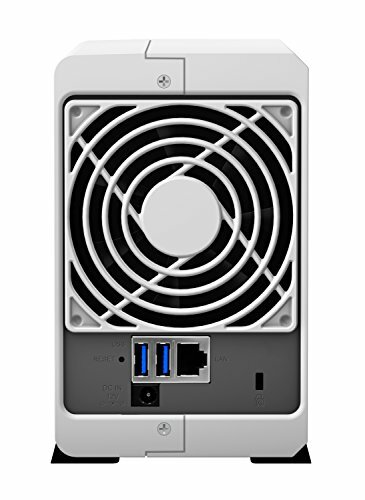 When it is up and running there may be some audible whirrings from the hard drives but the box itself is very quiet – even with its solitary fan going. It’s unobtrusive enough for the Lounge Room. As with some other, two-disk, Synology devices, it offers maximum sequential read speeds of 113MB/s and write speeds of 112 MB/s over Gigabit Ethernet, although your mileage will vary depending on file sizes and network congestion. You can double this speed with Synology’s superior siblings, but at significantly-higher cost. 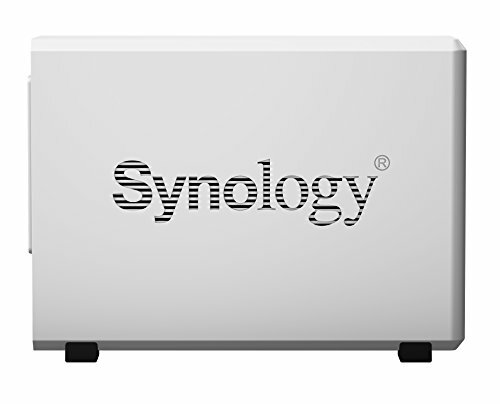 Of course, the highlight of Synology’s products is the DiskStation software and Synology’s feature set continues to balloon. Nowadays this manifests as a modular, browser-based application suite and multiple mobile apps. 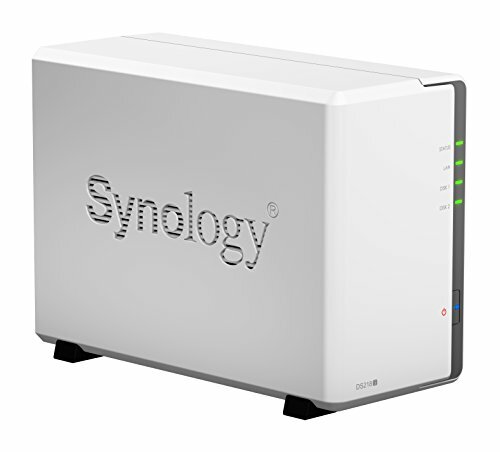 Synology itself provides a host of backup, security, multimedia (serving and organisational) tools. However, the range of high-quality, third-party, add-ons is also impressive. These include more backup compatibility from the likes of Acronis, media server functions from Logitech, Apple and Plex, file management and server applications from the likes of Apache, various mail server tools plus developer options for coders. 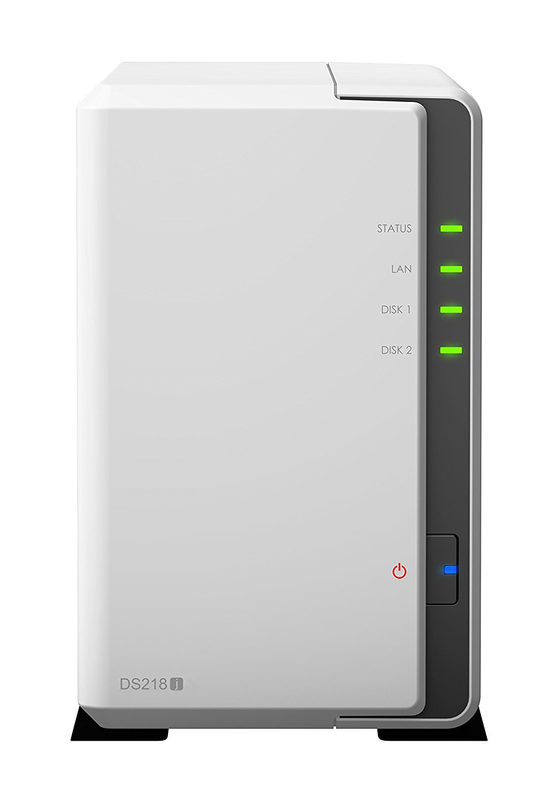 As for core features, the DS218j can perform real-time, incremental backups using small file sizes to prevent bloating. It also will keep multiple backups synchronised across a network. 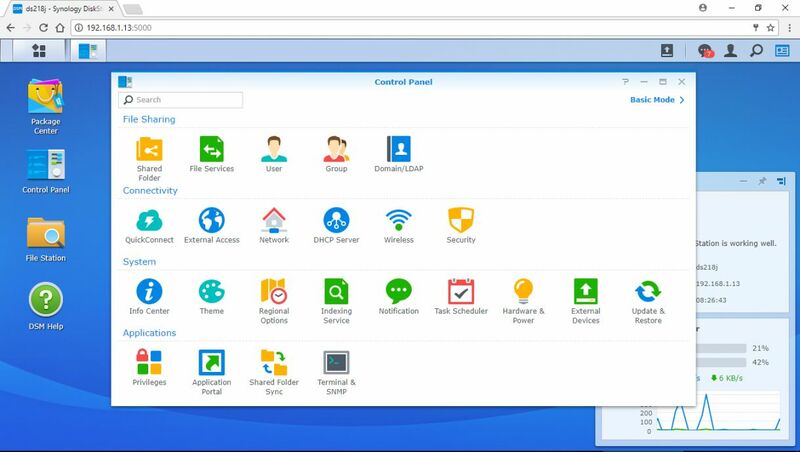 The QuickConnect tool allows you to set a secure online address for remotely access over the internet without configuring access rules on your router. Another potentially-major application is the Surveillance Station app which will manage security cameras for you. For some users, this is worth purchasing the DS218j for alone. dated, Windows 95 feel to it. While installing packages generally went without a hitch, the Synology Assistant app on one networked laptop couldn’t find the NAS while the wizard that promised to automatically configure our router failed. However, with everything accessible through a web browser window and the QuickConnect working like a charm, all was forgiven. That it so-simply streamed our 4K videos from a USB- connected drive via a web address was impressive. Build quality lends itself to home and home-office usage and its lack of robustness limits portability. While it will cater for a family-sized number of users, it will likely struggle acting as any kind of a professional workhorse. You can find cheaper alternatives, but few offer the flexibility, features and performance that the DS218j offers. It’s a great choice for anyone who wants to stick a disk or two in a box and have access to almost every feature on the market. However, if you work with large files, require portability you’ll be better off with a more-expensive option. 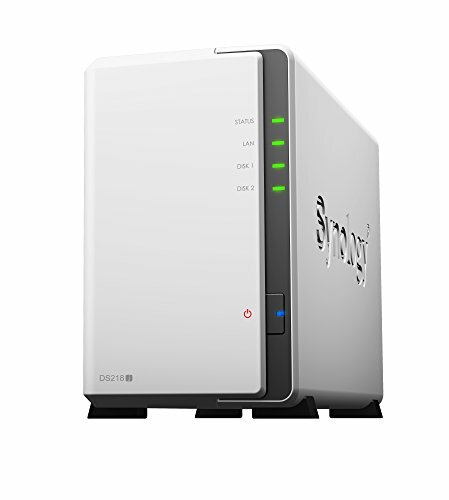 It may be one of the cheaper Synology models on the market, but there’s nothing entry-level about the DS218j’s performance or features. It’s a near-perfect NAS.